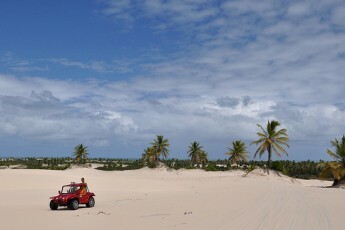 Mangue Seco is the last beach on the extreme north of the Bahia shoreline. The village is framed by the sand dunes, rivers and the sea. In Mangue Seco, we found the peixe-boi (Trichechus inunguis) in the waters of the Fundo River. Other rivers meet here to reachthe Atlantic Ocean, and the mixture of fresh and salt water makes the perfect condition for the mangroves, and consequently, the abundance of sea food. All over the shore you can find pousadas, restaurants and the local fisher’s house.